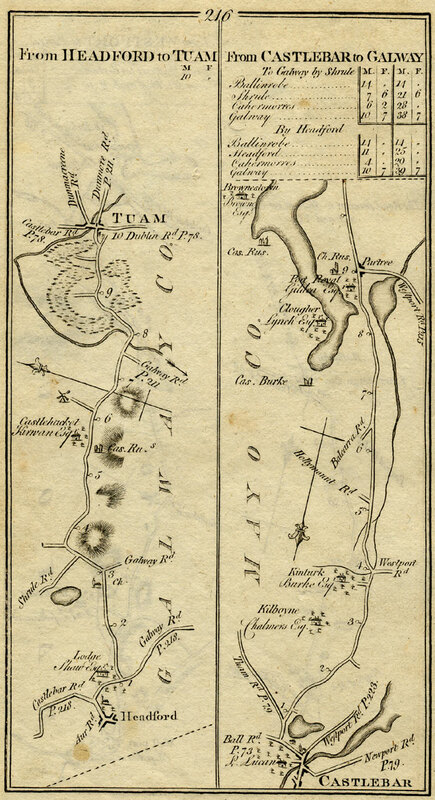 The following Taylor maps were made in 1778. I have tried to correlate the Mayo parts of the Taylor maps to modern maps of the area. The numbers along the road are mile markers. Most maps today have the north at the top of the map. The Taylor maps are forced to fit the pages. However, the arrows always point north. These wonderful maps show the seats of the local landlords and points of interest along the routes. 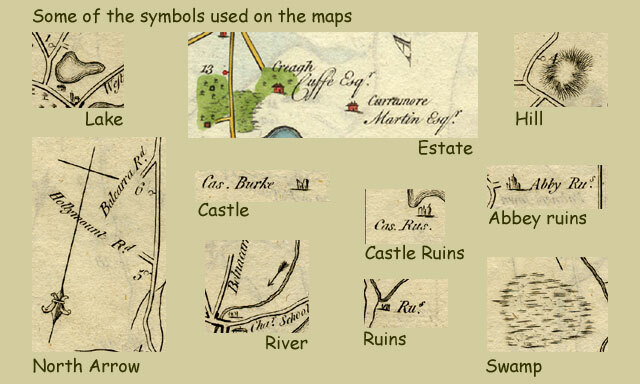 Some of the features shown are: Castle Ruins, Ruins, Church Ruins, Abbey Ruins, Swamps, Rivers, Hills Lakes, Towns, and Estates. 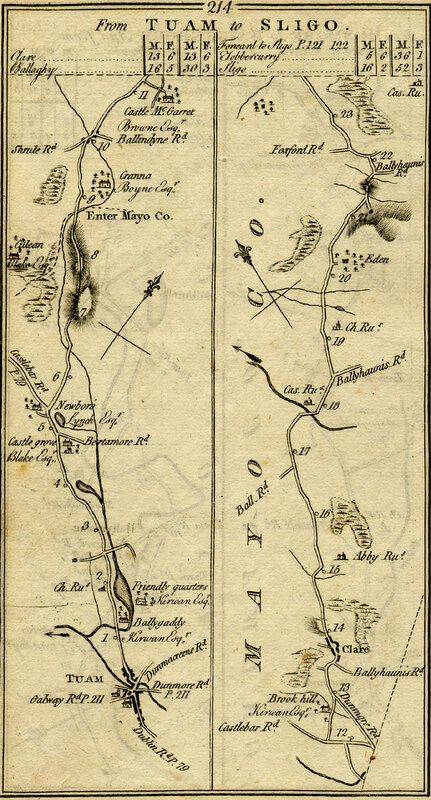 Although a few roads have been improved and new roads added, the roads shown on these maps have not changed much since 1778. Dunmore, County Galway lies about 20 miles east of Ballinrobe, County Mayo and 8 miles south east of Clare (Claremorris), County Mayo. 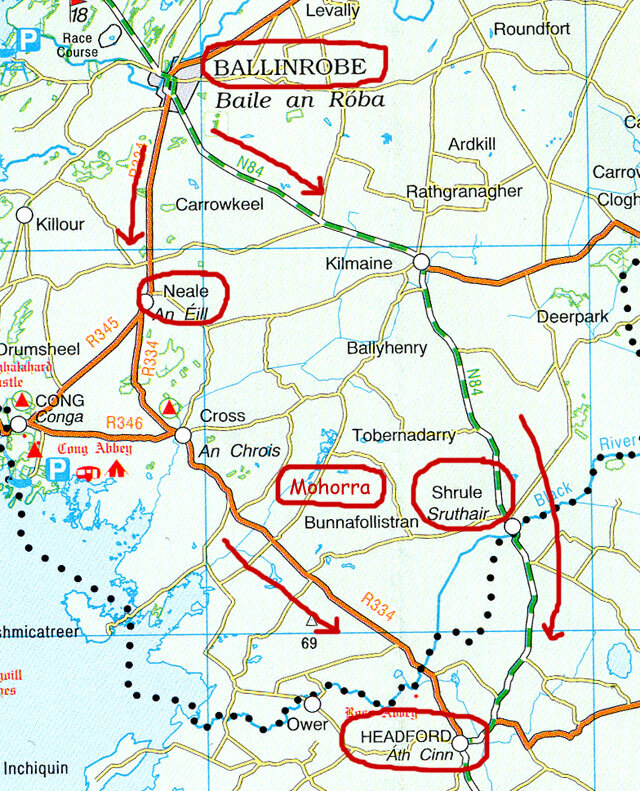 The left side of the map shows the road from Dunmore through Ballindine (just west of the Mayo border) then northward to Clare (Claremorris). The right side shows the road from Ballindine through Hollymount to Ballinrobe. 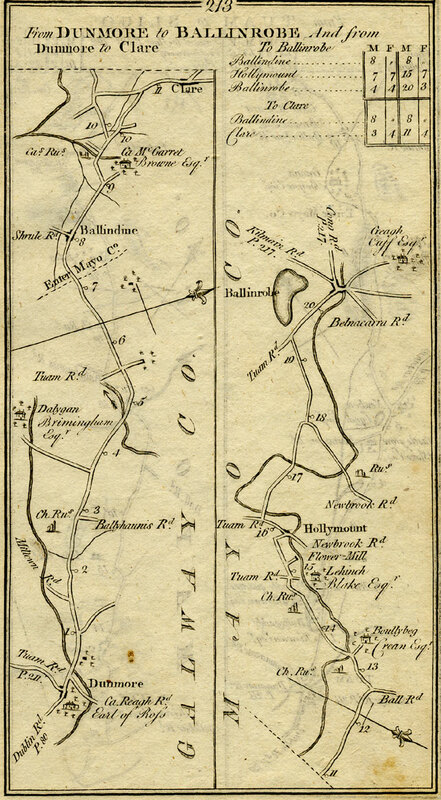 This section of a current Ordnance Survey Map correlates to the right hand side of Taylor map #213; the road from Ballindine through Hollymount to Ballinrobe. Tuam, County Galway lies about 20 miles south east of Ballinrobe, County Mayo and about 18 miles south, south east of Clare (Claremorris), County Mayo. The left side of the map shows the road from Tuam north into County Mayo ending just short of Clare (Claremorris). The right side of the map shows the road through Clare (Claremorris) and north east toward the border of County Sligo. The last part of this road is on map #215, see next map. The left side of the map shows the remainder of the road from Tuam to County Sligo near present day Charlestown. See map #214, above. 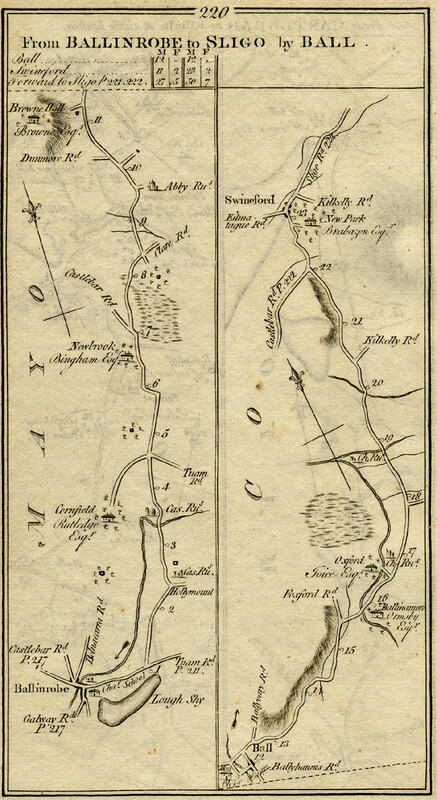 The right side of the page shows the road from Westport to Partree. Note: This route continues on map #217 and #218, see below. 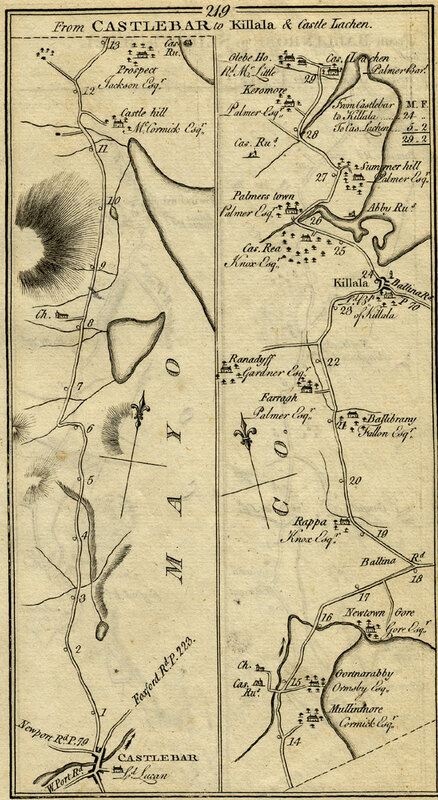 The left side of the page shows the road from Headford to Tuam, which are both in County Galway. Headford is about 18 miles south, south east of Ballinrobe just across the Galway border. Tuam is about 18 miles east of Headford. The right side of the page shows the road from Castlebar to Partree. The road to Galway continues on maps 217 and 218. This section of a current Ordnance Survey Map correlates to the right hand side of page 215 showing the road from Westport to Partree (Partry) and the right side of page 216 showing the road from Castlebar to Partree. The roads from Westport and Castlebar meet in Partree and continue on through Ballinrobe. 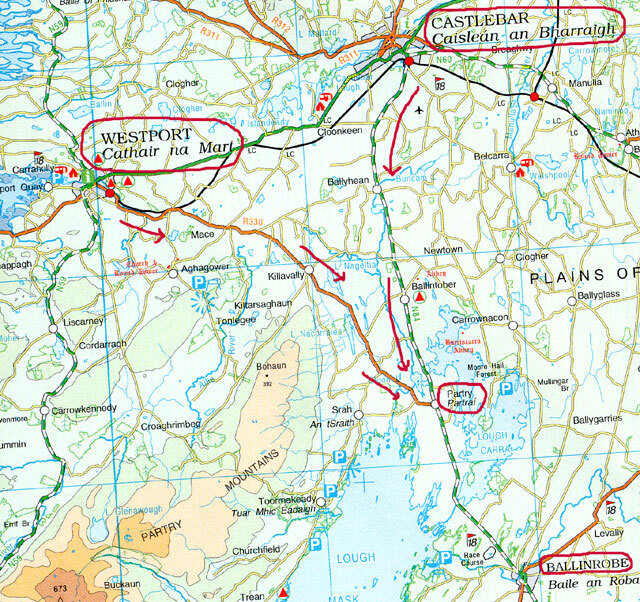 This map shows the route from Partree through Ballinrobe through Shrule or the Neale to the Galway border near Headford. See next map from Headford to Galway city. 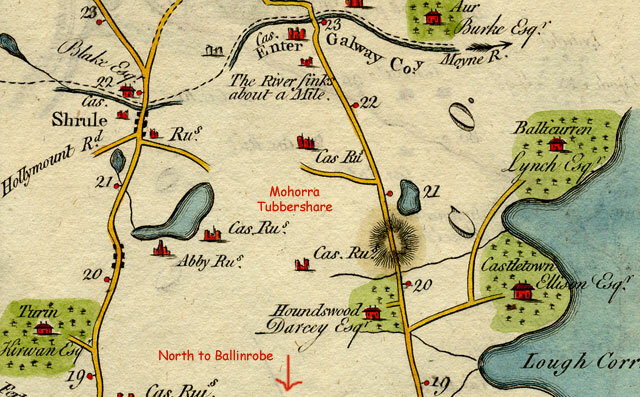 This section of a current Ordnance Survey Map correlates page 217 showing the roads from Ballinrobe through the Neale and also through Shrule to the Galway border. This is a continuation from pages 216, and 217. This map shows the route from Headford to Galway City. Herdford is just across the Galway border south of the village of Shrule. This map shows the route north from Ballinrobe, through Hollymount, Ball (Balla), Swineford and on to the the border of County Sligo. The beginnig of this route is the same as that on page 213. After passing Hollymount instead of going east towards Balindine, the route goes north through the Plains of Mayo towards Balla. 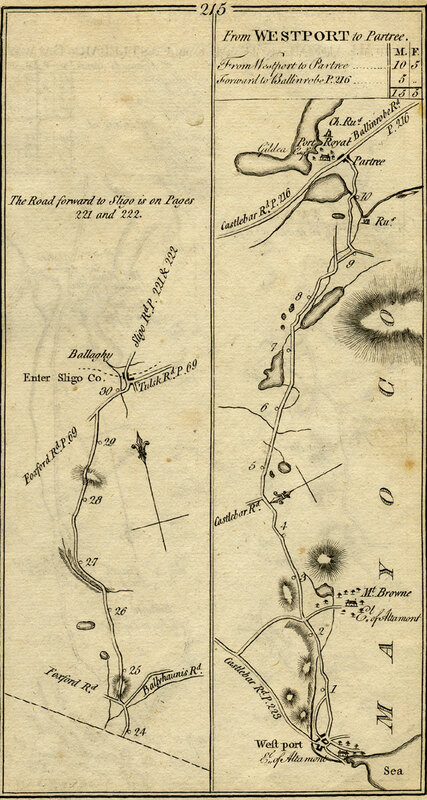 The current roads going east, west, and south from Castlebar and Ballinrobe are pretty much the same as in the 1778 maps and many of them are national primary or secondary roads or improved regional roads. 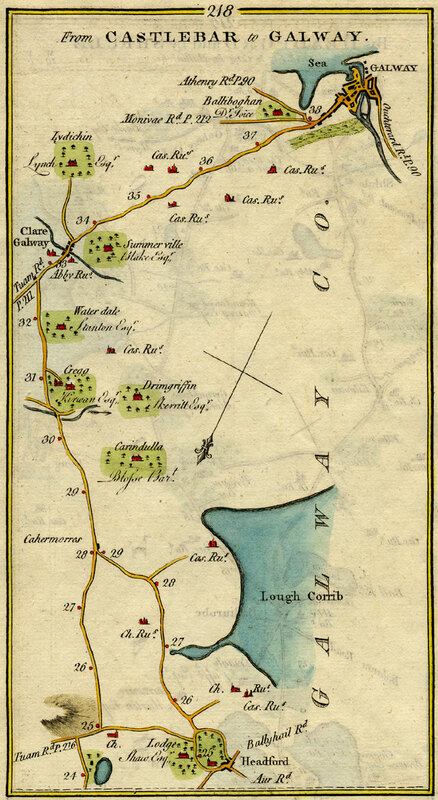 On the other hand, the 1778 maps of the areas to the north of Castlebar and Ballinrobe do not correlate well with current maps and much of the route is on what is now labelled "third class roads". I am having a very hard time correlating the landmarks and roads on the map #219 (Castlebar to Killala) with the landmarks and roads on a modern map. 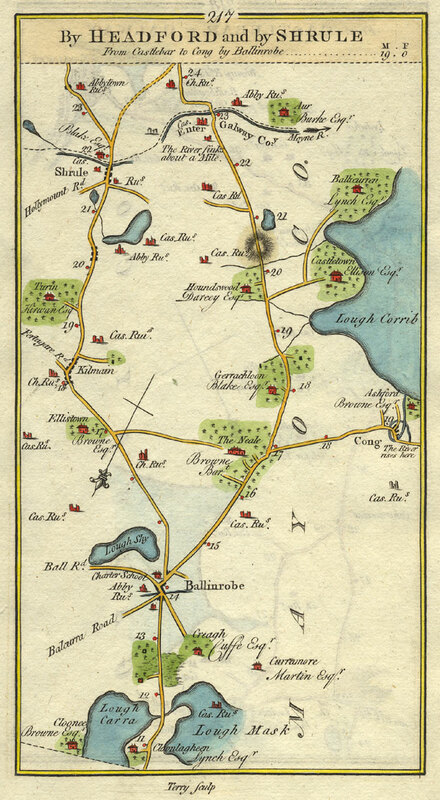 While it is possible to trace the route from Ballinrobe through Hollymount, Balla, and onto Swinford shown on map #220, most of the roads on the current map are listed as "third class roads". The map on page 217 covers the area where the Walshs, Langans, and related families were known to have lived. Detail of the town of Ballinrobe. Lough Sly is not listed on a current map of the area. Knockanotish was the part of town where the family of John Walsh lived from at least 1869 until at least 1882. Carrownalecka and The Friarsquarters. The Walshes lived in Carrownalecka from at least 1865 until at least 1867. In later life John Walsh lived in Friarsquarters. Mathias Langan and family lived in Friarsquarters from at least 1877 until at least 1879. They were living on Creagh Road from the late 1870s until the left for America in 1892. Detail of the area around Mohorra Tubershare. The Byrnes, Naughtons, and Langans lived in Mohorra Tubbeshare.